This is deception. There are lots of alternatives, and better ones than stocks, and less risky. For example: T-bonds! In early 2014, there wasn’t one analyst on Wall Street that recommended T-bonds. In fact, almost everyone said to stay away from T-bonds because of the low yield. Once again we were in the minority with our bullishness on T-bonds. We wrote to ignore the yield and focus on the potential capital appreciation as interest rates globally would decline. The relationship is mathematical: lower interest rates = higher bond prices. We were right. 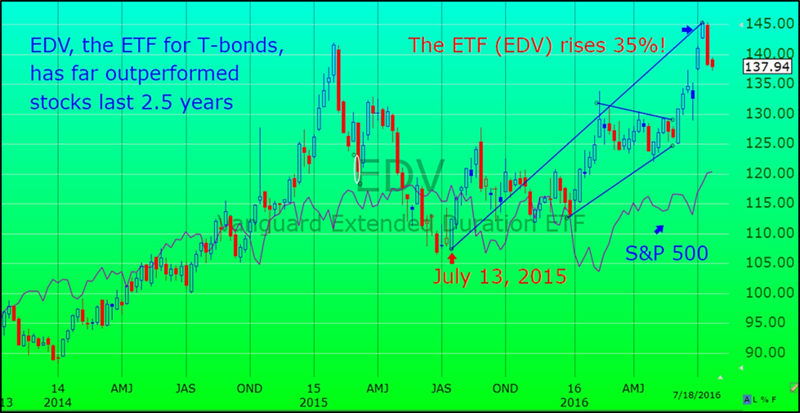 Over the next 13 months, the ETF for T-bonds we recommended (EDV) was up a fantastic 51%, far outperforming the stock market. Then came the inevitable pullback which always occurs after a big upmove. However, just recently the EDV made a new high, rising another 35%. As you can see, this one call far outperformed the S&P 500 (thin dark line) since 2014. Members to our new, revolutionary HEDGEFOLIOS service profited handsomely during that time as our models held heavy positions in T-Bond related ETFs. Look at the great performance of our five model portfolios so far in 2016 and how they all drastically outperformed the market, as represented by the S&P 500 (the green bar is the S&P 500). The “proof in the pudding” as they say is when a program not only outperforms during a bull market but also when the markets plunge as it did in the first six weeks of 2016. Just look at how our HedgeFolios performed when the S&P 500 plunged from January to February; our HedgeFolios had strong rises. Then, when the S&P 500 staged a rally thereafter, our HedgeFolios continued to soar to incredible gains. Yes, you too can sleep at night with HEDGEFOLIOS. This is not a managed account program. Instead, we provide you with our professional investment guidance via our five model portfolios, which you can conveniently replicate in your own account. You are in full control. You can simply line up your portfolio with our models, or you can fine-tune the positions held if you prefer.